There are many premium hookahs available on the market with a wide array of a traditional and modern touch. To avoid confusions regarding your choices, it is important to know the features and experience it delivers. Therefore, depending on whether you’re a seasoned smoker or just starting out, you can treat yourself with one of the following hookahs. What Are The Best Budget Hookahs to Buy in 2019? 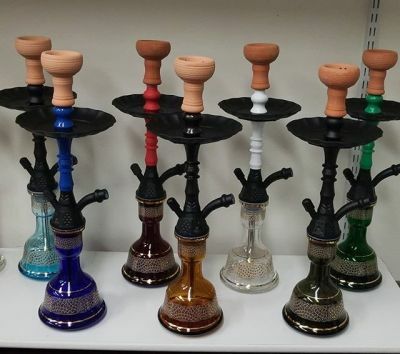 With the evolution of hookah industries, there are hundreds and thousands of hookah brands with their potential consumers. Some of them have retained the old and traditional method of water pipes, whereas many of the brands have come up with the latest innovations and trends. In the middle of this competition, I believe a brand like Khalil Mammoon has maintained its tradition and stood still in the cutthroat competition. KM has never disappointed with its unique handcrafted hookahs and over the years, they have attracted more and more hookah lovers. Unlike the traditional hookahs, this hookah bunker delivers a very unique kind of smoking experience with a modern touch. Made from the materials like plexiglass and stainless steel, this bunker stands as tall as 13.5 inches with a cubical shaped plexiglass vase. In order to provide a long lasting hookah experience, the bunker is internally made with the stainless steel in order to prevent it with rust. 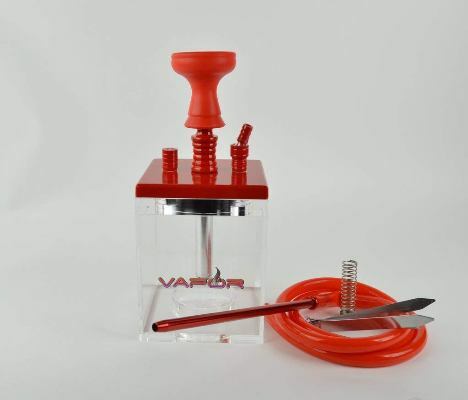 This vapor hookah bunker has detachable parts for deep cleaning along with the hose. The hose available with the bunker is quite flexible with the lucid airflow. 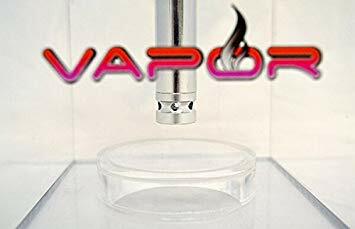 The design of the vapor container is flat and the top portion is very tight in order to make a good amount of smoke at the base. Additionally, there is enough space in the silicone bowl that allows you to pack your favorite shisha flavor. There is no requirement for the additional grommet. Another interesting feature is that there is a rechargeable LED light base at the bottom which lights up the hookah. The vase of the bunker is plexiglass material which means it is long lasting, unbreakable and durable. The hookah bunker comes in a complete set which includes a built-in diffuser, matching silicone bowls, grommets, hookah tongs, and washable silicone hose. 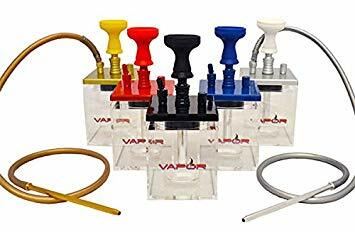 The vapor hookah bunker set is available in four colors- Black, Blue, Red, and Yellow. For Whom is This Hookah? • This is an absolute basic starter kit. Anyone wanting to try it out without spending a bunch of money, this is the kind of kit you can buy. The vapor bunker can be packed up easily into a small package in order to take it with you anywhere you travel. • As a beginner in smoking, you don’t have to worry about assembling, disassembling and cleaning as the components are quite easy to handle. • For someone like seasoned hookah smokers, this vapor bunker might not amuse them. • The heat management system is not good in this hookah as the ashes of the charcoal gets spread over and makes cleaning cumbersome. • You can enjoy your hookah session with this modern hookah bunker in many ways. The additional accessories you require are your choice of shisha tobacco, foil pack, choice of your coals which is not included in the hookah set. .• Try blue mist which is worldwide popular as well as blueberry mint, double apple, grapy mint, and grape berries. For the coal, pack coco brico is considered the best with the vapor hookah bunker for a long lasting smoke. Additionally, the charcoal is odorless and burns easily using the electric heater. Easy portable – because of detachable parts, you will be able to pack it in a box and take it wherever you want. Great performance for the price – The hookah performing like a charm, you will get good clouds and unique smoking experience. Easy to clean – The hookah is extremely easy to clean, along with the washable silicone hose. 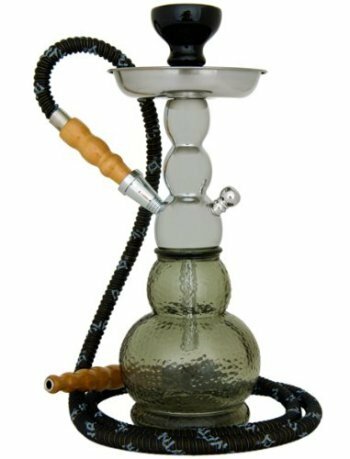 Long lasting – The materials like stainless steel, plexiglass, and silicone will make this hookah lasts a long time for a fair price. An ashtray isn’t included – You will need some kind of heat management system in order to prevent ash from falling all around. This hookah is among one of the affordable and high-quality hookah from renowned Mya. This hookah can be used in more ways than just smoking. It stands 13 inches tall with elegant design and available in beautiful colored glasses which looks like a decorative art piece. It weighs 3 pounds which is very lightweight to use and 4×4 inches wide. It comes with a long leather hose of about 6 ft long with a metal ring at the suction point. Additionally, you will get matching porcelain bowl, pokers, tray, foil pack, cleaning brush and rubber grommet to make sure the hookah is airtight. Additionally, if you want to change your hookah into a double hose, you get an extra small Mya hose adapter. Therefore, such a state of art makes your hookah sessions more enjoyable. Is this right hookah for you? • This hookah set is highly recommended for the beginners as it provides good airflow and easy to smoke. • While smoking, you can feel the fumes produced inside the base generating dense clouds. The bases are super easy to clean after every hookah session. • There is an option to convert it into two hoses and the process of conversion is super easy. All you have to do is remove the purge valve and fix the Mya hose adapter over there. Your hookah is ready to serve with your friend. • This small and portable hookah is great for use and also nice for decorative purpose. It comes in Amber, black, dark blue, green, pink, the purple color which adds grace to your hookah sessions. • Mya Econo provides 2 hoses and a mya adapter so that you can easily fix the second one and ready to use. This makes your hookah session more enjoyable with co smoker. • Many smokers have a complaint with its bowl as it can pack a lesser amount of shisha tobacco. So you can use a bigger bowl instead. It is highly recommended to use silicon bowl of medium size which has great heat conductivity as well as easy to clean as compared to the porcelain bowl. You can also use channel bowl which is used in the Egyptian hookahs. • Additionally, the bowl is odorless and you can use a wide variety of your favorite flavors. For best experience use island mango or prickly pear. Great hookah for the price – Good clouds and great performance are expected from Mya this is a go for hookah for beginners. Easy to set up – You will not have trouble to put all pieces together. Two hose option – The adapter which is included in the set will give you a possibility to smoke with friends without impact on performance. The hose is non-washable – This type of hose is usually a problem because it will cause flavor ghosting in the long run. Should invest in a new bowl – For some people, this is not a con but I highly recommend to invest in Phunnel or vortex bowl. The GSTAR deluxe series hookahs have a decent recognition in the premium hookah market. These hookahs are designed based on the Egyptian configuration that is packed with the luxury and pleasure of smoking. The design of this hookah is quite modern but the manufacturers have considered to give it an old traditional touch. The GSTAR hookah is packaged with the bottom base, two hookah hoses, center shaft, down stem, ceramic bowls, charcoal tray, and tongs. The hookah hoses are 15 to 20 inches long which is pretty decent for such quality and affordable hookah. It stands tall with 18-inch height. The weight is little more than the earlier hookahs, but considering the height, the weight seems pretty decent. That means you can experience the goodness of smoking your favorite flavors for longer sessions. Is this hookah exactly what you need? • This best cheap hookah is getting descent popularity among the new hookah connoisseur and well as the experienced ones. • The travel case is included in this hookah set. If you are looking to carry in your journey, it is a very comfortable one. • The ceramic bowl packed with this bowl is not of good quality and is fragile. Rather you can prefer a silicone funnel bowl or better a cloud lotus. The space in any of the bowl is sufficient to pack a good amount of shisha. • The plastic hose which is not so good quality. The nozzle of the hose is also out of shape with little blemishes. Standard hookah hoses may not be compatible with GSTAR series. So you had better consider the hoses of GSTAR itself for better compatibility. • With just two charcoals on the top, you get very big clouds. The coals most preferred for this type is Zebra smoke. • The flavors like Hydro herbal shisha and herbal molasses are best preferred which are nicotine free products. Great for beginners – Perfect for the first time smokers who don’t want to spend a lot of money on the hookah, also a great thing for hookah parties. Easy to clean – With a brush, you will easily be able to clean every part of the hookah. Easily portable – You will be able to carry it all around with your carrying case. The quality isn’t so good – Hookah is made of cheap material which can be concluded with regard to the price. The bowl is small – In a bowl can be packed about 10 grams of shisha, which is less compared to other pipes on the list. The design of the Pharoah’s Nysa Hookah is handcrafted in the Egyptian style keeping in mind the traditional values it delivers. The Pharaoh’s Nysa hookah set comprises of the components like the base, stem, downstream, hose, tray, bowl. The height from base to bowl is about 22 inches with the weight 4.2 kg. The bowl used in Pharaohs’s kit is made of clay which is odorless and good for melting the molasses. Into the purge, this hookah has an extremely wide open port, a plastic bowl that expels at the sides than at the top. Now regarding the base, it is just flat-out excellent, relatively thick glass wall and aesthetically pleasing to look at. The bowl that comes with the stem is quite unique to the other hookah packages in the hookah market. The bowl is unglazed and features 4 sets of three holes on the sides of the bowl. This will provide a different smoke like an Egyptian style bowl. The tray is a bit smaller than other companies but it is just a heavy duty to get enough get by and also has a unique design to it that is quite nice on the eyes. There is no rust accumulation and no discoloration, so the finishing is quite good. Also, the weight of the hookah is quite staggering. It was a nice and long hose with a 72-inch length. This pharaoh silk hose is very nice to smoke with and is fully washable. The downstream has a built-in diffuser for smoother draw and filtration. Is it a good hookah for you? • The Pharaoh hookah kit is little light weighted, unlike any other Egyptian brand hookah. • This will amuse even experienced smokers. With the lightness and easily assembled materials, it is perfect for the starters when it comes to the traditional hookah experience. • It is better to use coco Nara natural charcoal rather than the titanium coals. • For better flavor experience with this hookah, pack your bowl with herbal ice mint for long lasting freshness. 100% Washable hose and pretty long hose -According to the company website the hose is fully washable. A great feature for that price, the hose is flexible and long enough for smoking from your favorite position. Clay Bowl – Clay is an excellent heat conductor, and although it’s a traditional bowl, you could get a great session if you use a less juice shisha. Great quality for the price – in all likelihood, this is a good and affordable hookah for beginners but also for those who are more experienced. Small Ashtray – Although it’s a beautiful design, a little ash of coals will end up on the table. Khalil Maamoon is among the world-renowned brand of hookah apparatus as they maintain their age-old tradition manufacturing the best hookahs and deliver a great smoking experience for the smokers. It has a rich history that dates back to the 19th century Egyptian cultures. Since then, they have kept this hookah at the top and among the favorites in the hookah market. While manufacturing, they consider the standard grade hookahs so that they could provide the best smoking experience. 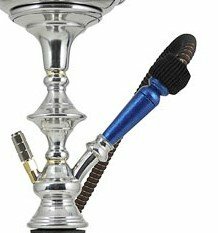 Therefore, this 22-inch tall beautiful trophy style hookah will provide you with a great experience and something more than just smoking. The hoses of Khalil Mamoon gives you the Egyptian experience with smooth airflow and well-balanced smoke output. Apart from that, Heavy duty stems, traditional handmade base design and authentic craftsmanship deliver 100% satisfaction to their consumers. With the purchase of this Khalil Mamoon product, you will get an authentic KM stamp on the tray, KM pro hose of about 72 inches, a metal tray, clay bowl, grommets, and tongs. It is a fact that KM provides quality hookah products, but you will find inconsistencies that vary from batch to batch. As their manufacturers craft handmade process, you may find a lot of variations its design and sizes over the years. • Khalil Mammoon is widely used by seasoned smokers in the hookah market. • Experienced hookah smokers really like to have longer sessions. Thus KM bowls have a winning factor as they can pack a decent amount of shisha tobacco to ensure longer sessions. • Since the first try, you will get a good smoke and incredibly large clouds as well as it purges well too. • The most widely used flavors are KM tobacco itself and Tangiers tobacco. • The stem of KM hookah is huge, so there are some cleaning difficulties at times. However, you can run warm water into it with an elongated brush to wipe out the molten molasses. • If the packages bowl does not perform well, you can use a vortex bowl. • For the charcoals, Coco Nara natural coals are highly recommended with KM hookahs. Great quality – As expected KM has never disappointed with the quality. 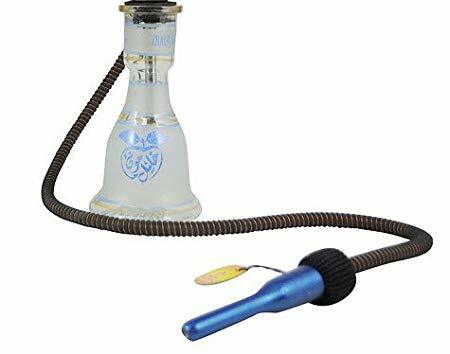 Amazing smoking experience – With this particular hookah you will get the best smoking experience at a reasonable price. Hand-Made Hookah – Unlike the others hookahs on this list, this is the only one handmade by experienced Egyptian craftsmen. Possible shortcomings in manufacturing – Because it is handmade, it is very likely to have imperfections in the crafting. The Habibi hookah pipe set standing 24 inches tall is one of its kind. It comprises the glass base which is quite rigid and ensures durability. Along with that, it has silver painted stripes with the complete sturdy black colored stem. Now coming over to the components Habibi hookah provides along with the kit. You will get classic tongs, a ceramic bowl, leather-wrapped hose, and an ashtray. This hookah set seems to be simplistic with its style but promises to deliver dense and bigger clouds. This hookah set is the most light weighted as compared to its competitors. The weight of this hookah pipe barely tolls over 2 kg which is very handy. This hookah is very convenient for someone who wants to get a refreshing hookah session during traveling. Who should consider this hookah? • This hookah is the best cheap hookah for the starters as it comprises of everything needed to get started. Also, the components are super easy to assemble and disassemble and quite easy to clean. • The hookah is easy to carry while traveling and the components are super easy to assemble and disassemble. • However, this hookah is not right for the experienced ones as they will not find a long-lasting and quality smoking session. • The smoke formation while using is inferior to the above-mentioned hookahs. You have to use more charcoals like 3 pieces in order to get a good smoke. • Not all the flavors will taste good. It is better to use blue mist, as usual, which is favorite and compatible with many hookahs or any flavors that have a strong essence. Lightweight – Because it’s lightweight you will be able to transport the hookah for indoor or outdoor smoking. Wide ashtray – The ashtray is wide so you will not get the mess after a smoking session. Hard to measure the water level – Because of the black color of the base, it will be hard for you to measure the water level. Cheap material – This is low priced hookah so the material used for crafting is quite cheap. Small Bowl – Bowl can’t hold a lot of tobacco so we considered this as a con. The first-hand experience with the Mya Econo and Pharaoh’s Nysa, for the others on the list we researched a bunch of websites to find the best cheap hookahs for the lowest price and with the best performance. This list is created after a few days of searching for the best one suitable for beginners who want the best possible from hookah but with a very limited budget. We believe that you can’t find better hookah for under $100, than those on our list. So if you have a small budget try out one of those hookahs and you will gain enough experience, to get into a much better and more serious hookah in the future. hello! this is a wonderful site and i usually get pleasure from the info posted right here. Bookmarked and shared. Many thanks once again! This Khalil Mamoon is an excellent choice for serious hookah smoker who wants to get GOOD shisha experience at a great price.